The winning entry in a competition to design the first new British coin series for 40 years has been unveiled. The designs, which each feature a part of the royal coat of arms, will be on coins from 1p to £1, with the familiar Queen's head image on the other side. 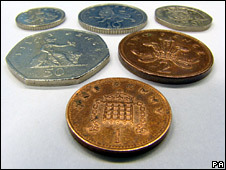 Old coins will remain legal tender alongside the new versions being introduced this summer. The designs mean no more 50p coins with Britannia, the female personification of Britain, will be produced. There were 4,000 entries to the public competition to find the new designs. Matthew Dent, 26, from Bangor, Gwynedd, won the competition. He will have his work stamped on the side of millions of coins. The royal coat of arms featured in Matthew's designs are a symbol of the reigning monarch. Mr Dent said: "For designs of mine to appear on a medium as significant and prestigious as the United Kingdom's coinage and to be produced and circulated in millions is a tremendous honour." The six designs on the 1p through to the 50p coins can be pieced together to form a complete image of the royal shield of arms. The £1 coin features the complete shield. It is the first time a single design has been used across a range of coins in this way. 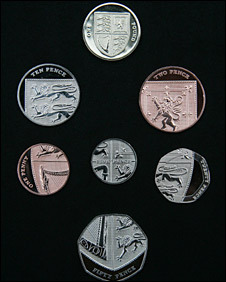 Coins featuring the old familiar designs such as the one penny piece's portcullis and chains will stay in circulation. This includes more than 800 million 50p coins featuring Britannia. The removal of Britannia from the 50p coins prompted a handful of MPs to ask the Government to intervene earlier this year. When the new coins are introduced this summer it will not be the first time the Britannia has not appeared on the 50p piece. For example the 2006 50p featured a commemorative design to mark the 150th anniversary of the Victoria Cross. Andrew Stafford, chief executive of the Royal Mint, said the new designs represented a very important day in history for British coinage. "It is the only work of art that every member of the general public touches every day, that is important to the nation's way of life," he said. The new designs will be the first wholesale change to the country's coinage since the first decimal coins were struck in April 1968. The seven coins that will change are the 1p, 2p, 5p, 10p, 20p, 50p and £1. The £2 coin was introduced in 1998 and is not being redesigned. The front of the coins will continue to bear the same portrait of the Queen, by Ian Rank-Broadley, which has been on coins since 1998. Sir Christopher Frayling, the chairman of the Royal Mint Advisory Committee said the existing coinage will remain in circulation, including the Britannia 50p." "There are 806 million Britannias in circulation at the moment. They will remain in circulation. They will see all of us out, until they die a natural death. So whatever happens, Britannia stays around, " he said.